I participated in a campaign on behalf of Mom Central Consulting (#MC) for Pull-Ups. I received product samples to facilitate my review and a promotional item as a thank you for participating. 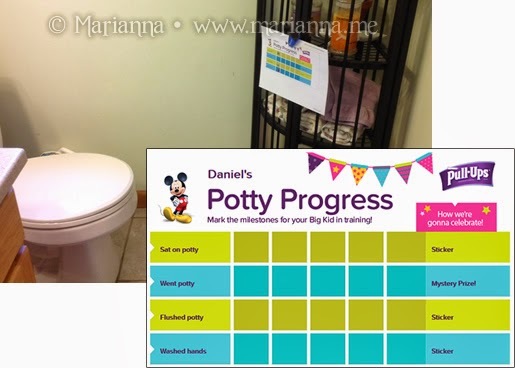 OK so it is time for our Potty Training Progress Report; or maybe I should really title this our "Lack Of Progress" report. If I had thought that having potty trained three children already would have adequately prepared me for the fourth and final child, I would have been dead wrong. Apparently, this last one is going to be the absolute hardest. Daniel turned 4 in December and well, I had been procrastinating this for a little bit now. 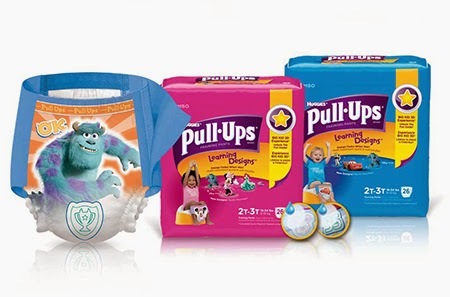 Being a Pull-Ups First Flush Ambassador gave that final push I needed to get started. Now my first son I potty trained when he was 2.5 years old. I was lucky that he took to it so well and we were done in a matter of weeks for daytime training. With the twins, I waited until they were 4 since they both had significant speech delays and communication was difficult. But once we got started, everything went fairly smoothly. Which once again brings me to my current little monkey. He also has a speech delay and speech apraxia which is why I held off as long as I did. But both myself and his preschool teachers feel he is ready to start this journey. It is just too bad that Daniel doesn't agree with us. No, he wants absolutely nothing to do with the potty. We're been working on this potty training for over 4 weeks now and we are pretty much at the same spot we were at when we started. When he's at home, I place him on the potty repeatedly throughout the day and his teachers do the same thing when he is at school. I will keep him on there for about 5 minutes in hopes that this time will be THE time he actually goes...but no such luck yet. The Pull-Ups website has a lot of useful tools for parents and I've been using it to help me a long. My favorite tool is the customizable rewards chart. You enter your child's name, the items s/he can get a reward for and the reward for each one. I've got this hanging in our main level bathroom and we've been adding stickers every time he sits on the potty. In between potty breaks, he has been running around in his Lightning McQueen Pull-Ups and with the help of the Big Kids app, we have a timer set up to let us know when it is time to sit again. I started off with the potty breaks pretty far apart as I got him used to the idea and now the alarm is set to go off more frequently as I really try to get things moving (pun intended). 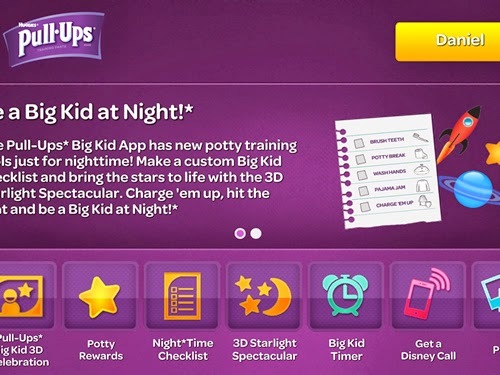 The Big Kids app also has rewards and games to help get your child excited about potty training.The app is available for free on iTunes and Google Play. So it seems like we are at a bit of an impasse here as Daniel hasn't actually gone while sitting on the potty. So I think it is probably time for mommy to kick things into high gear and double my efforts. I'm happy to have Pull-Ups and all of their resources at my disposal because at this point I need every bit of help that I can get. Be sure to stop by in April for my next progress report - hopefully with some actual progress! 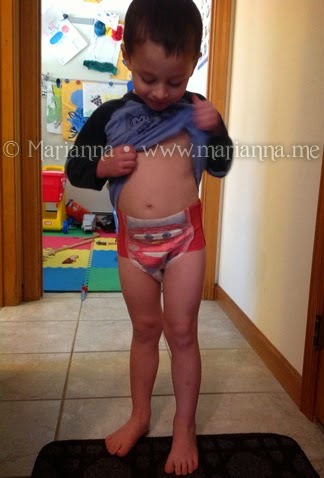 Do you have any tips for potty training a stubborn 4 year old?